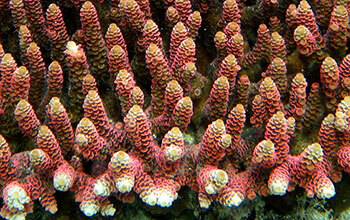 Staghorn coral (A. millepora). A recent study suggests that corals in the Great Barrier Reef have enough genetic variation to adapt to and survive rising ocean temperatures for at least another century. Using genetic samples and computer simulations, evolutionary biologists have made a glass-half-full forecast: Corals in the Great Barrier Reef have enough genetic variation to adapt to and survive rising ocean temperatures for at least another century, or more than 50 years longer than previous estimates have suggested. "It means these corals will still go extinct if we do nothing," said Mikhail Matz, associate professor in The University of Texas (UT) at Austin�s Department of Integrative Biology and lead researcher on the project. "But it also means we have a chance to save them. It buys us time to actually do something about global warming, which is the main problem." 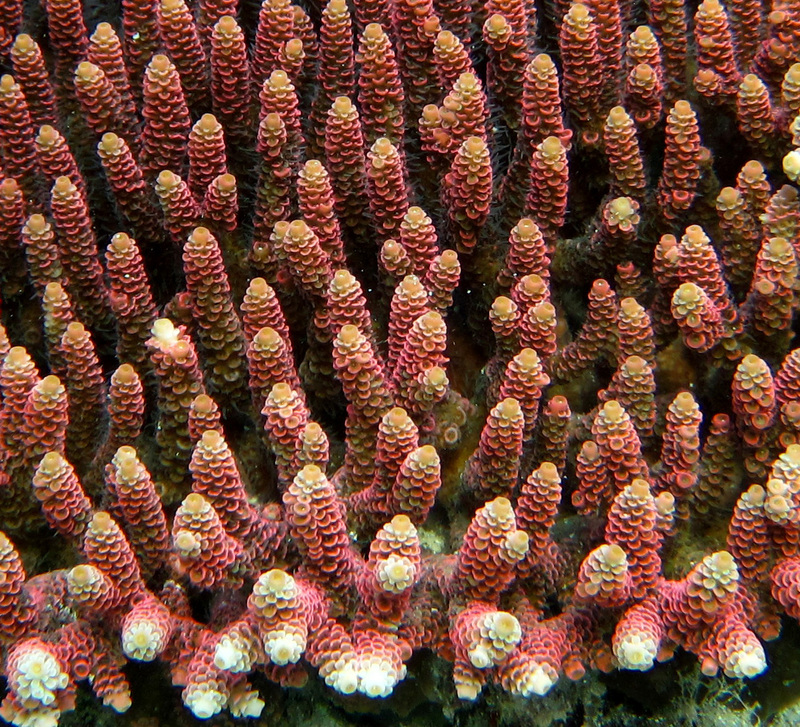 The source of the coral�s resilience lies in genetic variations across connected but widely dispersed populations, the researchers say. Each coral colony produces a million larvae every year, and those larvae float on currents for up to several weeks until settling on a new reef. As conditions change in a particular location, for example, the water warms, individuals of the species that are less adapted die while better-adapted individuals thrive. Over time, if incoming larvae supply genetic variants for increased hardiness, the local population shifts to the hardier variety. "This genetic variation is like fuel for natural selection," Matz said. "If there is enough of it, evolution can be remarkably fast, because all it needs to do is reshuffle the existing variants between the populations. It doesn�t have to wait for a new mutation to appear; it�s already there. The problem is, when the genetic variation is exhausted, it is over and the future is unclear." This research was funded in part by the National Science Foundation (NSF).